You are viewing this Brand New Officially Licensed NFL Football Fan Apparel Item. 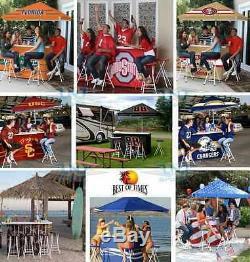 Choose Your NFL Team L-Shaped Tailgate Portable Party Bar w/ 4 Stools & Umbrella. 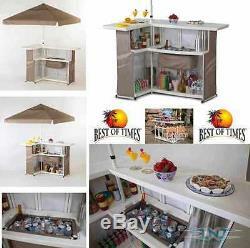 Best of Times Ultimate Party Bar includes steel frame, 3 levels of shelving, 4 stools, umbrella, in-shelf cooler, rolling bag, & carry bag. (Item is Made to Order). Show some pride and support of your favorite NFL Football Team at your next tailgating or backyard party with this officially licensed L-Shaped Portable Bar with 4 Stools and Umbrella! Deluxe Package includes: Steel Frame, 3 levels of shelving, bar frame wrap, 4 bar stools, patio umbrella, in-shelf cooler, rolling bag, and carry bag. This Ultimate Tailgating and Homegating Portable Party Bar from Best of Times is the perfect complement to your tailgate parties, patio, backyard, man cave, and special events. High strength tubular Steel Frame structure is a one piece unit that easily unfolds for setting up and folds up for transport or storage. L-Shaped Bar design with three levels of shelving which the top is standard bar height and the outer frame is decorated with a Team Color Bar Wrap with Team Color Logo. Four (4) Folding Bar Stools that are made of a steel frame, cushioned vinyl cover seat with a matching Team Color Logo Cover, and each stool has a 400 lb. Providing shade to the party bar is an 8 ft. 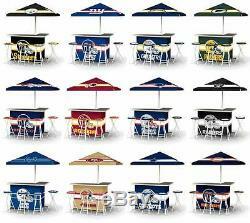 Tall Patio Umbrella which is also decorated with a matching Team Color Design and Team Logos on all four sides. Bar Wrap, Bar Stool Covers, and Umbrella Top are a matching design that is made of 500D Polyester that is UV Protected, water resistant, and fire retardant. All fabric materials are vibrant in color with silk screened officially licensed Team Color Logos. High-density polyethylene blow-molded plastic shelving (Top and 2 Levels of interior shelves) will withstand the elements, are lightweight, and very easy to clean. Waterproof in-shelf Cooler that will hold up to a case of your favorite beverages along with ice and can also be used to keep your drinks cold during transit because it is functional enough to use as a stand alone cooler. Drop-in Cooler is made of a tubular steel frame, 600D polyester outer body and features a leak proof PEVA (lead free) inner lining. Compact heavy duty polyester Rolling Travel Bag and Carrying Travel Bag for easy transport and storage. Sets Up in Minutes - No Tools Required: Unfold one piece frame, snap and lock all three levels of shelving in place, velcro attach bar wrap around frame, set umbrella pole in frame hole, unfold bar stools, and put covers on. Once your bar is assembled, it will accommodate all your party food and beverage needs! This Outdoors or Indoors Entainment Center was engineered for everyday use at home, but completely portable. Have all the other tailgaters envy you when you set this party bar up at the next big game! For those house divided fans out there, team designs are interchangeable. All the benefits of a built-in bar at a fraction of the cost. Comes with instructions and we also provide video below. Officially Licensed by the NFL. Standard Package which does not include the four stools is available in our store. One piece folding unit made of tubular steel with HDPE blow-molded plastic shelving. Length: 63" (Front/Long side of "L") and 41" (Short side of "L"). Depth: 19" (Top shelf - Bar Top) and 26" max depth- cooler shelf to top shelf. Corner of Top Shelf to Corner of L-shelf: 70. Folding white color steel frames with cushioned vinyl seats. Team color covers with silked screened team color logos. Covers made of 500D Polyester that is UV Protected, water resistant, and fire retardant. 30" (H) x 14" (W) x 18 (Base of stool folded out). Top made of 500D Polyester that is UV Protected, water resistant, and fire retardant. Square Four Panel Team Color design top with silked screened team color logos. 2 piece metal pole that locks together. Shade Length: 72" x 72" (6ft). Made of 500D Polyester that is UV Protected, water resistant, and fire retardant. Team color design with silked screened team color logo. Velcro fastens to bar frame from inner corner to inner corner. Made of Tubular Steel, 600D Polyester, & Leak Proof PEVA (lead free) inner lining. Easy to clean and can be used as stand alone cooler. 24" (L) x 11" (W) x 10 (D). Made of heavy duty polyester canvas with hard plastic bottom. Rolling caster wheels on bottom for easy transporting. Zipper closure with large carry and pull along handles. 56" (L) x 22" (W) x 16 (D). Total weight: 75lbs (Complete bar assembly packed). Made of heavy duty polyester canvas. Zipper closure with carry handles and large shoulder strap. 40" (L) x 15" (W) x 9 (D). Total weight: 31 lbs (All stools packed). The product collage images shown only depict the party bar in various setups and teams. All Portable Bar Packages are made to order and if you want a custom package, please contact for details. Product Size: 63" (L) x 44" (H) x 19" (D) x 41" (W) Product Color: Team Colors & White Product Material: Steel, 500D Polyester, HDPE Plastic, & PEVA. Additional Notes: The Best of Times Bar is the first and only portable, customizable Bar and Home Entertainment System that is affordable for the everyday American. Change the look to suit any occasion with many themes. The Ultimate Party Bar can be used inside or outside! NFL SHOP AT LORRINA'S HOT DEALS. BEST PRICES ON THE NET - BLOW OUT SALE - WHOLESALE PRICING. Visit Our Other Store Items at Lorrina's Hot Deals. Please visit their website to read about important information regarding receiving package. You may or may not have to sign for your package. That is determined by the driver if they can leave it at your door or in a secure place. NO PO BOX Addesses Allowed! INTERNATIONAL BUYERS - PLEASE NOTE. Thank you for your time and business! When your replacement product(s) are reshipped to you, there is no extra cost to you and a return call tag label will be provided for returning the damaged or defective item. We want your shopping experience with us to be a "5 STAR" experience. Once your item(s) arrive, please make sure that your order is correct, intact, and complete. Upon doing this, you will also be able to rate on a scale of 1 - 5 in the four categories. We will make every effort to make your experience top notch! Powered by SixBit's eCommerce Solution. The item "Choose Your NFL Team L-Shaped Tailgate Portable Party Bar with 4 Stools & Umbrella" is in sale since Thursday, September 11, 2014. This item is in the category "Sports Mem, Cards & Fan Shop\Fan Apparel & Souvenirs\Football-NFL". The seller is "lorrinashotdeals" and is located in Dana Point, California.